My third recipe for the USA Dry Pea & Lentil contest is a savory lentil gravy. The lentils are roasted in the oven along with a prune stuffed pork loin. 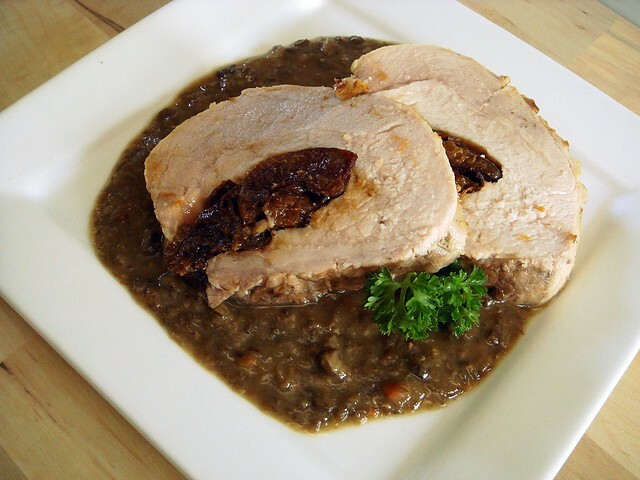 I've had a similar pork loin for Christmas from a Lidia Bastianich recipe, and knew the flavor of the prunes would pair well with the lentils. Pardina lentils, along with carrots, onion, garlic, and baby portobello mushrooms are added to the bottom of a roasting pan with chicken broth. As the pork loin cooks, the juices infuse the lentils with more flavor. After the pork finishes cooking, taking about an hour and a half, the perfectly cooked lentils are pureed and added to a roux made from butter and sweet rice flour. The puree is thinned with a little chardonnay and more chicken broth, and served with slices of pork loin for a tasty and unique take on a traditional Sunday roast and gravy dinner. 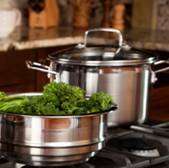 Le Creuset, one of the sponsors of the contest, gave another Farm Fresh Stainless Steel Steamer Pan to giveaway to one of my readers. The pot is really nice to cook in, as I've had the pleasure of doing, and I'm sure you'll like it, too. The pot retails at $185 so you're getting a pretty nice treat if you win. 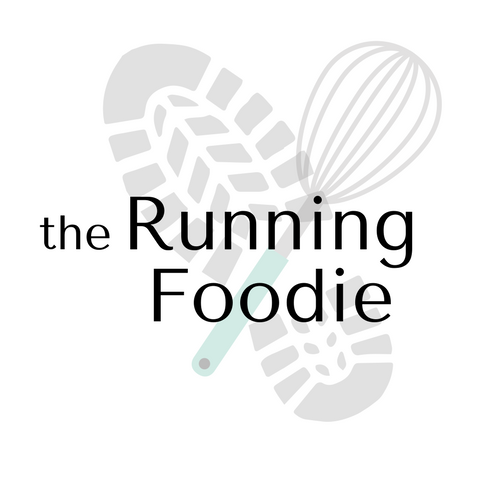 Tweet about this giveaway, linking to this post and adding @runningfoodie. Comment again to let me know. Giveaway is open to US residents only due to shipping costs. Contest ends at noon this Friday. Good luck! Pour orange juice over prunes and let sit for 30 minutes to an hour. Preheat oven to 450 degrees. Slice a deep pocket on the side of the pork loin, reaching to the center. Don't slice through the ends, like a sub. Stuff the pork loin with the prunes and sliced garlic, leaving 4-5 prunes out. Tie the pork loin with kitchen twine to keep the filling in place as it cooks. Place in roasting pan. Combine the mustard, olive oil, salt and pepper and spread on the top and sides of the pork loin. Roast for 15 minutes. Lower oven temperature to 400. Add lentils, vegetables, remaining prunes and soaking liquid to bottom of pan along with 1 cup chicken broth. Cook for another 25 minutes. Continue cooking for another 30-50 minutes, until the pork registers 160 on an instant read thermometer and the lentils are tender. Add more chicken broth throughout the cooking time to keep the lentils moist. Taste the lentils throughout to check on the tenderness. Remove pork loin from the pan onto a platter and cover with foil to rest. Scrape the lentils and broth into a food processor and pulse until smooth. Add additional chicken broth if needed. You should have about 2 cups. If not, pour in more chicken broth. In a large skillet over medium heat, melt butter. Whisk in rice flour and stir for 30 seconds. Add chardonnay and whisk for 30 seconds. Add lentil puree and 1 cup chicken broth. Stir to blend and simmer until heated through. Push lentil gravy through a fine mesh sieve before serving. Slice pork loin into 1/4 inch slices and serve with gravy. Although I haven't made them (yet! ), I think the lentil enchiladas sound really delicious! As a vegetarian, I am a huge lentil fan. I love your chocolate raspberry cake- I would never have even dreamed of sticking lentils in baked goods. My favorite is definitely the cake. 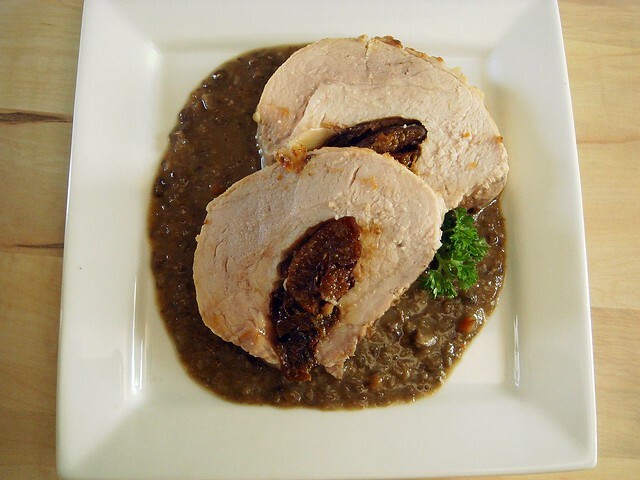 My favorite lentil recipe you've posted has got to be the prune-stuffed pork loin with the roasted lentil gravy. Why? Well, for starters, I love stuffed pork loin, it always comes out so tender. I am a huge fan of prunes and dates in dinner recipes, for a little bit of sweetness, mixed with something savory, such as the lentil gravy. The combination of sweet and savory is so awesome on the taste buds. Excellent creation; you're right, it is a unique twist on a traditional pork loin dish. This one is definitely my favorite! I love pork loin and this is a new way to prepare it that I will have to try. I love, love lentils! and my favorite is definitely the cake! Definitely this roasted lentil gravy is my favorite! my fiancee would love that pork! i might have to pluck up the courage and get cooking some meat! I think I have to go with the chocolate cake because it's SO unique and interesting. But this also looks amazing. I love lentils! And this Le Creuset is basically my dream true :) SO pretty!! lentils in cake-how can anyone NOT like it? i love surprising my friends by revealing the secret ingredient AFTER the enthusiastic consumption! I have to say the chocolate cake because that is so unique! I like the gordeeeetaaas most! I think I would enjoy the non-kosher dish the most. I like this because you usually don't use pork.